Quebec, Canada - Last month, New Way® displayed its Sidewinder automated side loader at the Canadian Waste and Recycling Exposition in Montreal, the largest show of its kind in Canada. New Way® representatives Ken Beugger, Carl Pezold and Phil Allen were on hand to exhibit the Sidewinder's features to Canadian waste professionals. 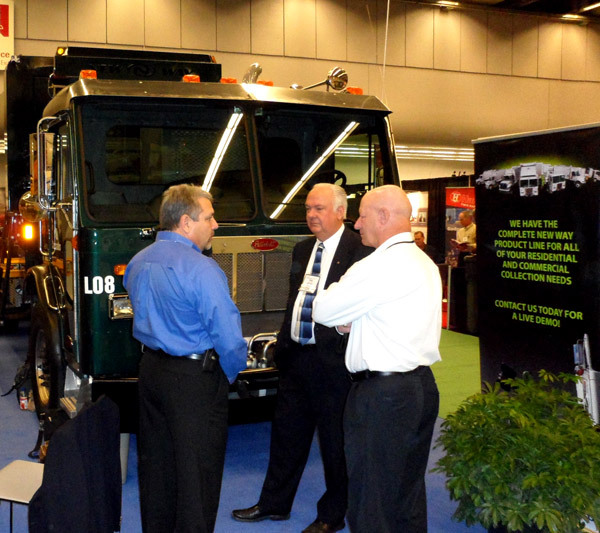 Phil Allen reported that attendee response to the truck was overwhelmingly positive. New Way® continues to demonstrate a commitment to growing its market in Canada. Its Canadian dealer network offers the full New Way® lineup of refuse equipment in addition to the all-new Sidewinder. Thanks to its rugged design and impressive specs, the Sidewinder is gaining popularity with waste professionals. The company has seen a recent surge in Sidewinder sales, including a fleet of 10 trucks sold to Sacramento, California. Available in capacities from 20 to 31yd³, the Sidewinder also boasts an 8-second cycle time, 1000 lb. capacity arm and 12 foot arm reach. This was New Way®'s first time attending the Canadian expo, where more than 190 other companies exhibited and thousands of professionals attended. "We're energized by the time we spent in Quebec and we're looking forward to continued growth in Canada," said Phil Allen, Executive VP of Sales and Marketing. "We enjoy meeting Canadians and hearing what they are looking for in their manufacturer of choice. You can be sure that our support for the Canadian market will continue to increase."